Spontaneous decisions embody the spirit of travel. 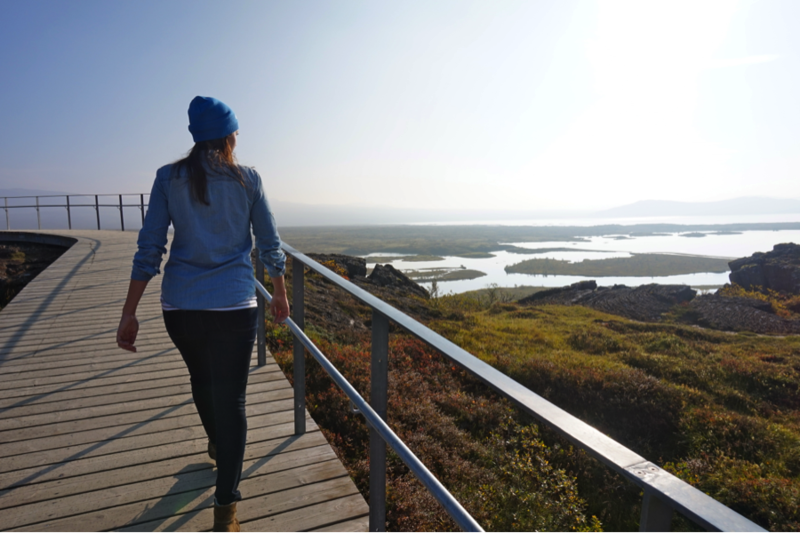 Two weeks prior to jetting off on my six-month around the world journey, I was offered an opportunity to switch my flight; leave five days early and stopover in Iceland to discover what this Nordic gem has to offer. Reykjavik is the largest city in Iceland and is a sister-city to my hometown of Seattle. Seattle has 21 sister-cities in total. I plan to visit five throughout my six-month journey. The Reykjavik-Seattle relationship began in 1986 and has since fostered multiple educational exchanges and aided in the completion of the Icelandic Room in the Nordic Heritage Museum in Ballard. Additionally, the largest Icelandic community in the United States calls Seattle their home. Without hesitation, I rebooked my flight and couldn’t have been more excited to visit the land of fire, ice and volcanoes – a mere 7.5-hour non-stop flight from Seattle. I arrived in Keflavik Airport at about 6:30am Iceland-time, excited for my adventure to begin! My first impression of Iceland was that it looked very similar to Seattle in its landscapes and vistas (we’re spoiled) but on a much more saturated level. The darkest lava rocks, the greenest moss, and the bluest crystal like water. I purchased FlyBus transfer tickets to Reykjavik, a 50-minute ride. Along the way, I amused myself by attempting to enunciate the Icelandic road signs. Wanting to explore the city, I quickly checked in to my hotel and hopped onto a Reykjavik-city metro bus en route to downtown. Reykjavik has an excellent metro system and many, if not all, hotels provide complimentary bus passes for visitors. What a perk! The city reminds me of Seattle’s Capitol Hill neighborhood with small cafes, locals bustling around on bikes and cavernous like alleyways. Reykjavik is moderately flat and a trip up to the top of Hallgrimur’s Church, Iceland’s tallest building provides an amazing birds-eye-view of the city and surrounding harbors. I observed groups of friends gathering and dropping into trendy restaurants near Hallgrimur Church. As I passed, I perused menus, interested in immersing myself in delicious Icelandic cuisine. After four days in Iceland, my favorite bite of choice would turn out to be the famous Icelandic hotdog, which you can purchase at gas stations – yes, gas stations – and they are delicious. My biggest recommendation? 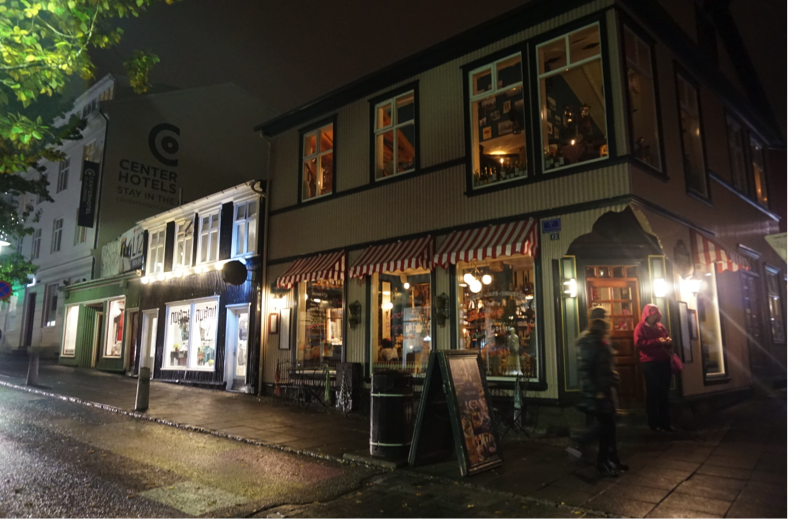 Use Reykjavik as a springboard to discover the real Iceland. You know, the one that you see in travel magazines and on desktop backgrounds. I opted to rent a car, wanting to stop and linger in the beauty I knew I would encounter. The Golden Circle route, a 8-hour day in total, is the most popular driving route since you can start and end in Reykjavik in one day. With rental car keys in hand, I drove the Golden Circle – exploring geysers, waterfalls and getting lost with 17-syllable Icelandic road signs. First up was a visit to Pingveller National Park. This is the location where the North American tectonic plate and Eurasian tectonic plates meet. As you enter the park you are situated on the North American plate, and you drive across the basin, literally traveling over the fault lines to the Eurasian plate. Be sure to hop out of your car and hike up to the viewpoint to notice the rift and cutouts in the hills caused by the plates colliding together over thousands of years. It was impressive. 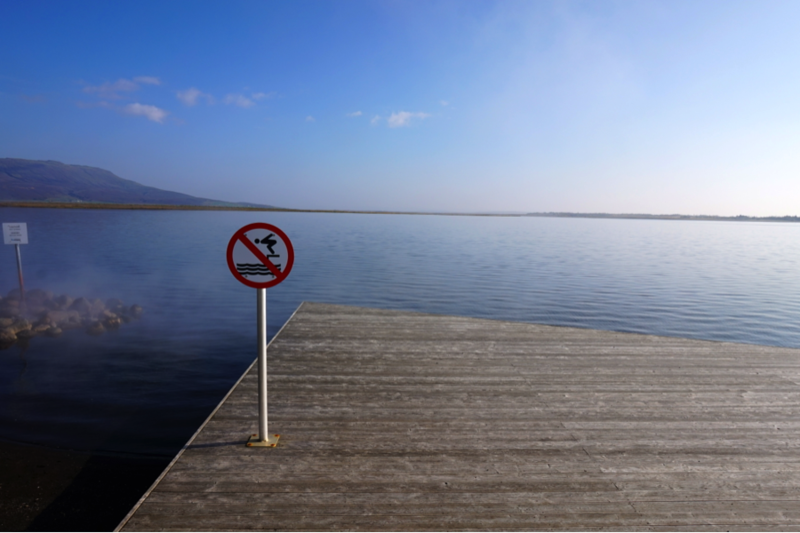 From there, I visited Laugarvatn Lake, a massive lake heated by thermal hot springs. It’s unreal to touch a lake, similar in size to Lake Union and have it feel like a hot tub. 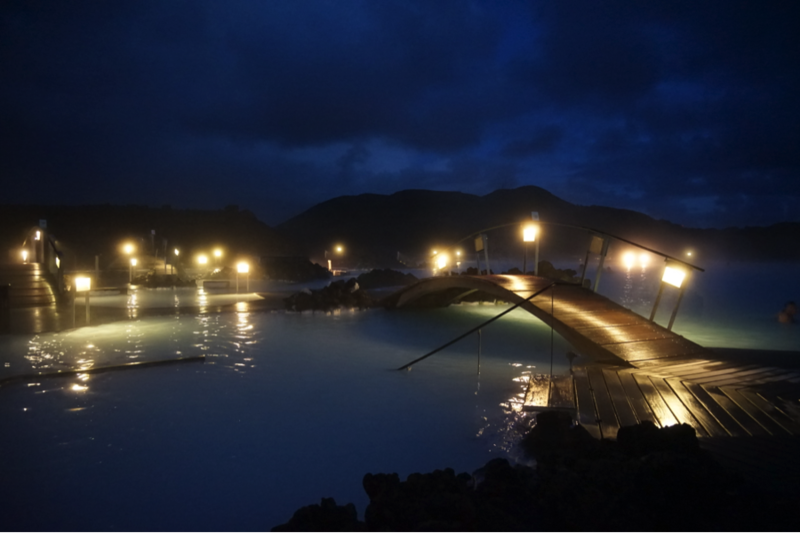 At the edge of the lake is Fontana Thermal Pools – an amazing and must stop, must take a dip – along the Golden Circle. Their on-site geothermal bakery provides geothermal baked bread, baked and served hot from the ground. Delicious! Driving 30-minutes down the road, I reached the “Geysir” Geyser, which shoots up into the air every five minutes, it was an incredible show. 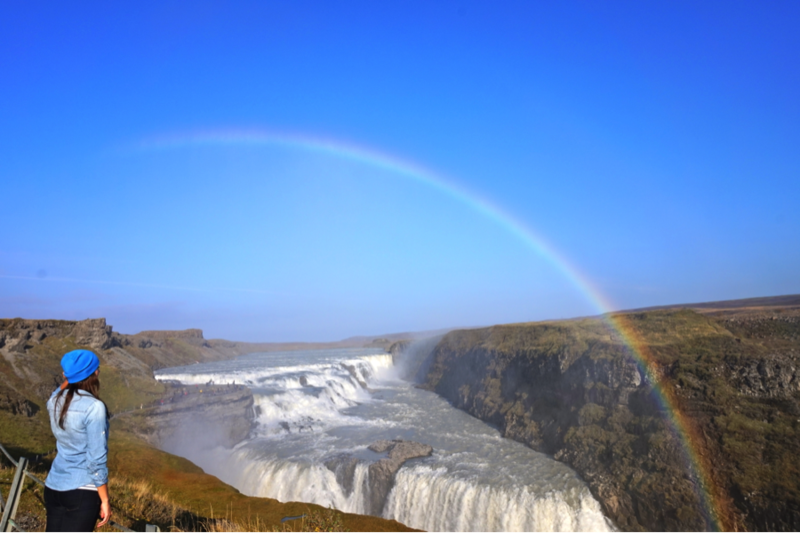 The next stop was the golden waterfall, Gullfoss. It was quintessential Iceland. The following day, with Reykjavik as my basecamp, I set off to explore south Iceland’s waterfalls. It was about two-hours before reaching the first waterfall, a drive full of narrow roads, thick fog and flat farm valleys. A left turn is all you need to see the first waterfall, Seljalandfoss. Due to its position along the hillside, you can actually walk right behind the falls and get a 360-degree, up close and personal view. Just watch out for that mist! 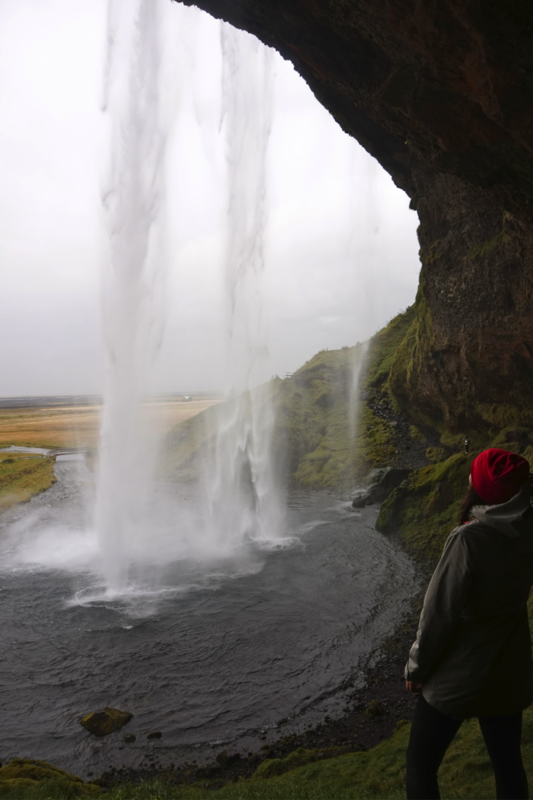 Standing behind the waterfall was a moment I will never forget in Iceland. Next, was Skogfoss waterfall, this time a taller and more powerful waterfall than Seljalandfoss. 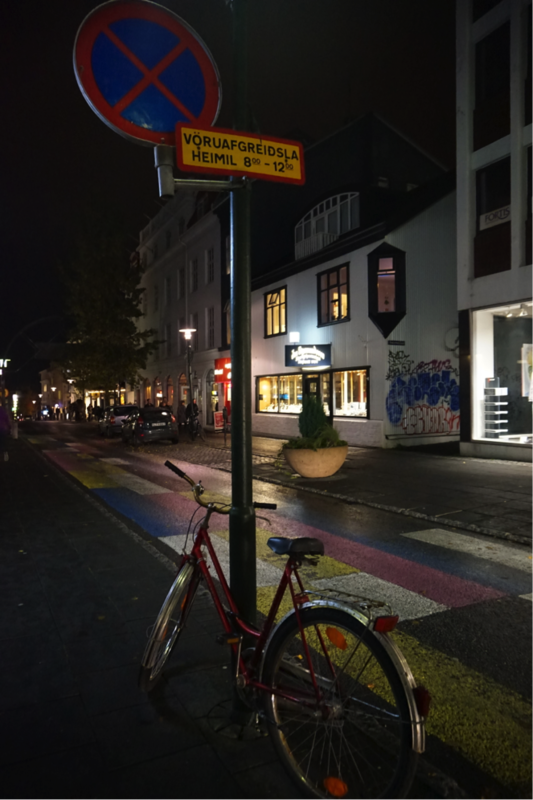 Retuning to Reykjavik and knowing no trip to Iceland should end without a swim in the Blue Lagoon, I planned to visit the lagoon en route to Keflavik Airport the following day. The Blue Lagoon and Keflavik Airport are only ten minutes by car in distance. 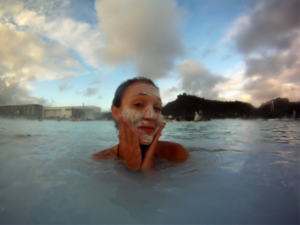 The Lagoon is vast and fairly crowded when I arrived, but I found an area of my own and applied thick silica mud to my face. It felt like the moon or some outer space world. Black lava rocks surrounded the edges of the lagoon so all you could see is the pools and Icelandic landscape around you. 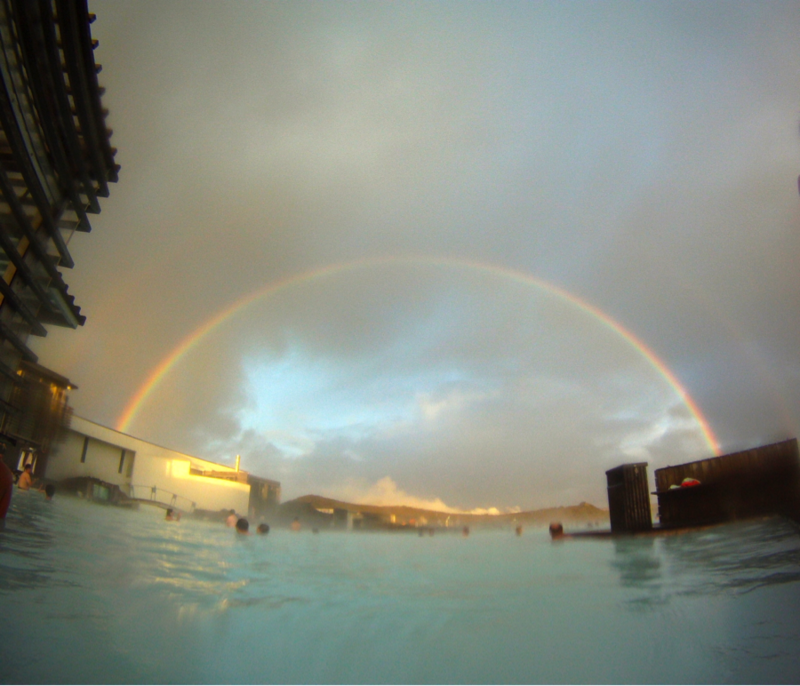 As light rain began to fall, and the sun set, a double rainbow emerged – it was bright and truly amazing. Relaxed from my few hours at the Blue Lagoon, I headed to the airport from my flight to Munich and reflected on my last few days. Whether spontaneous stopovers to an island in the north Atlantic, or weekend trips to nearby towns, I’ve learned so much more by seeing, exploring, and experiencing in person than reading or looking at pictures. 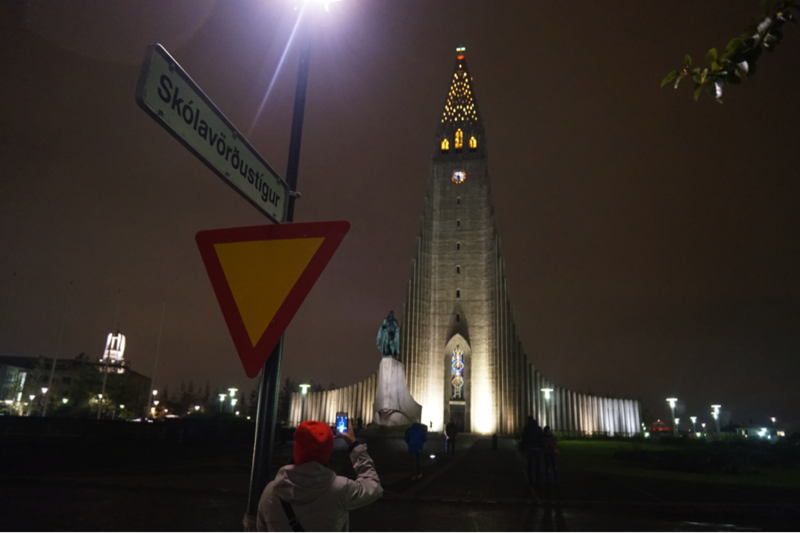 Visiting Reykjavik and exploring scenic Iceland was the perfect kick-starter to my around the world journey.